Glen 0' Dee Hospital opened on Christmas Eve, 1900, as the "Nordrach-on-Dee" private tuberculosis sanatorium - named after the sanatorium at Nordrach in the Black Forest, Germany. Glen 0' Dee was one of the first sanatoriums to use X-rays in the diagnosis and treatment of TB and had its own laboratory and X-ray department. The sanatorium finally closed in 1928 and six years later, in 1934, the building was re-opened as a luxury hotel. During the Second World War the hotel was requisitioned by the army and used to billet troops but after the war the building reverted to a sanatorium for treating ex-service personnel suffering from TB. In 1955 it became an NHS convalescent hospital and was commissioned for use as an infectious diseases hospital during the Aberdeen typhoid epidemic in 1964. It closed in 1992. The buildings are being refurbished as residential accommodation. Marischal college. The school of medicine has an excellent anatomy museum which is only accessible by special permission from the curator and is not open to the general public. Likewise, the university's Forensic Pathology collection is closed to the public Medical researchers, health-related professionals, educational groups and students wishing to use the collections should contact the Honorary Curator. Members of the public are allowed access to the Marischal Museum (Marischal College, Broad Street, Aberdeen, AB10 1YS) tel : 01224 274301 which has a surgical instrument collection as well as other items related to health and healing around the world and a collection of portraits of medical worthies. St Ronan's Well. The supposed healing property of the well water has been recognised since the 17thC. Robert Burns was a visitor here in 1787. A small spa opened in 1827, making Innerleithen popular with Victorians in need of curative waters. .
Excavation of a mediaeval hospital was carried out here in the 1980's and 1990's. Digging revealed pits containing blood and surgical waste. Later excavations revealed two surgical wards where it is thought amputations may have been performed with crude instruments on patients anesthetized with opium and hemlock. The local museum has a collection comprising historical medical and sick room equipment used in and around Dumfries, with accompanying documents, prints and photographs, including the medical and antiquarian collections of Dr T B Grierson, a 19thC country doctor in Thornhill. Ether anaesthetic was used at Dumfries and Galloway Royal Infirmary in 1846, shortly after the first public demonstration of its use by William Morton in Boston, USA. 52 Queen Street was Sir James Young Simpson's residence for 25 years and where he died in 1870. It was here, in his dining room which survives intact, that he first discovered the anaesthetic properties of chloroform in 1847. The building belongs to the Church of Scotland from whom permission should be sought to be admitted. Note that it is a working building which provides services to people affected by alcohol and drug use. Simpson also features in the Royal College of Surgeons in Nicholson Street. The college has a fine collection of portraits of its Fellows and the medical library has a fine stock of antiquarian books; permission to see the books must be sought in advance. The college has three distinct museums : the classical Playfair Hall with its major displays of pathological anatomy; the Sir Jules Thorn Exhibition of the History of Surgery; and the Dental Museum. The museums are available each weekday for anatomical and pathological study. Fellows and all registered postgraduate students have access to the Playfair Hall, on making themselves known to the Museum Office. The Sir Jules Thorn Historical Exhibition has some of Joseph Lister's carbolic acid machines, carbolic sprays and other memorabilia of his surgical work. There are also exhibits devoted to Benjamin Bell (1749-1806) , Sir James Y. Simpson and the "fastest man with the knife", Robert Liston (1794-1847). There is a re-construction of an 18thC pharmacy and a 19th C dentist's surgery. The museum is open on Monday to Friday 2.00-4.00 pm and admission is free. The Royal College of Physicians at 9, Queen Street was founded in 1681 and its library holds some 200,000 volumes including Simpson's personal library, his casebooks, letters and lecture notes. The college also owns a large collection of paintings depicting famous Scottish physicians. Admission is by prior arrangement. The Royal Botanic Garden was founded as a physic garden in 1670 and has a library containing over 3000 historical manuscripts and books. The earliest herbal dates from 1486. The library may be viewed by the public and the garden is open 9.00 until sunset , Mondays to Saturdays and from 11.00 on Sundays. The garden originally supplied fresh plants for materia medica. By 1676, there was insufficient space so a second garden belonging to the Trinity Hospital was leased from the Town Council. The garden stood on a site now occupied by platform 11 in Edinburgh's Waverley Station, where there is a commemorative plaque. In 1763 the garden moved to a larger site at Haddington Place in Leith Walk, where the stone-built gardener's cottage may still be seen close to a filling station; and finally, as the Royal Botanic Garden, it moved to its present home in Inverleith Row. It is the second oldest surviving physic garden in Britain after Oxford (1632) and ranks in importance with Chelsea Physick Garden (1673). Recently, the Royal College of Physicians have created a small physic garden named after the 17thC Edinburgh physician Robert Sibbald (1641-1722) who founded the original physic garden with Andrew Balfour. The Sibbald Physic garden comprises four raised beds: the first contains species described by the early herbalists ; the second represents the 16th and 17th centuries; the third moves to the 18th and 19th centuries. A free booklet that describes the new Sibbald Physic Garden is available from The Librarian, The Royal College of Physicians, 9 Queen Street, Edinburgh EH2 1JQ. Please enclose a stamped addressed 16 x 22 cm envelope. Sir Arthur Conan Doyle, the creator of Sherlock Holmes, was born at 11, Picardy Place (since demolished) but lived as a medical student at 23, George Square where there is a commemorative plaque. 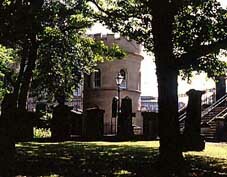 St Cuthbert's Church has a watchtower overlooking its churchyard which was erected in 1827 for the use of those guarding the tombs against the ravages of resurrectionists, the name given to a class of criminals who dug up newly buried corpses and sold them (no questions asked) to anatomy schools for dissection. The Royal Museum of Scotland in Chambers Street houses the Playfair Collection, originally presented by Lyon Playfair in 1858, which consists of apparatus, etc , illustrating the contribution of the Edinburgh professors of chemistry from the mid-18th century in the medical school. There are also some examples of early Florentine thermometers and European microscopes. The holdings of the Greater Glasgow Health Board Archive, one of the largest health authority archives in the United Kingdom, consist principally of the archives of the hospitals in the Glasgow area and in Paisley. These date back to the late eighteenth century when Glasgow Royal Infirmary was established. The archive also holds the prime records of the defunct Western Regional Health Board and of the Greater Glasgow Health Board. The archives include the minutes of governing bodies, architects' drawings of hospital buildings, photographs, accounts, correspondence, reports and records of patient care. Medical advances documented include antiseptic surgery (Lister), aseptic surgery (MacEwen), caesarean delivery (Cameron) and the use of X-rays (McIntyre). Developments in psychiatric care and nursing are also extensively covered. The records are subject to the legal restrictions on access which apply to all public records, namely a 30 year closure period for administrative records and a 75 year closure in respect of patient's clinical records. There is an established procedure by means of which access may be granted to records which are currently closed, usually subject to satisfactory assurances being given as to protecting the identity of individual patients. The records are stored in the Mitchell Library, North Street, Glasgow (near Charing Cross railway station) in space leased from Glasgow City Council. Please note the staff of Glasgow City Council do not have access to the GGHB Archive. As the GGHB Archivist spends much of his time in hospitals, clinics, and NHS offices therefore he can not be present at the Mitchell Library for the whole of the working week. Accordingly, it is essential that intending users should contact the before making a visit. Joseph Lister (1827-1912) worked at the Royal Infirmary, 82-84 Castle Street , where he introduced his ideas of antiseptic surgery though nothing survives of the wards where he performed his work as the present hospital dates largely from the early 20th century. There is however a commemorative plaque in the entrance hall and various items, including carbolic sprays, bougies and fermentation tubes used by Lister, which are now displayed in the Pathology Department Museum. Though his operating stool survives, the operating table is only a model. Admission to the museum is by prior arrangement only. The Royal College of Physicians and Surgeons was founded in 1599 and has one of the most comprehensive medical libraries in the world, containing over 300,000 volumes. There are further examples of Listeriana here including surgical instruments and microscopes. The library contains many of Lister's manuscripts and lecture notes and also those of his students The general public are not admitted to the college but interested visitors may apply to the Head Librarian to be shown around the building and its collections. The former King James VI Hospital was built on the site of an old Carthusian Monastery. The present building dates from 1750. The cupola with clock was added in 1764. Since its closure as a hospital, the building has been converted into self-contained flats. Based at Ninewells Hospital and Medical School, situated on the western outskirts of Dundee, the Medical History Collections are among the finest in Scotland, and include material from Dundee Royal Infirmary, Royal Dundee Liff Hospital and Sunnyside Hospital near Montrose.